Organic beer is one of the newest up and coming trend in the craft beer world. More and more we can find microbreweries experimenting with an organic ingredient or trying to produce a fully organic brew, which should come as no surprise. The organic movement as a whole has blasted off like a rocket over the past several years. People are beginning to realize that sustainable organic ingredients are not only beneficial to your body, but beneficial to the Earth and its farmers. So it is only rational that this movement would carry over to the beer world. The only problem with any shift to organic is insuring that you maintain the same level of quality. Sure, organic fruits and veggies are almost always better than their counterparts, but an organic pasta sauce, potato chip, or yes, beer, might not be. These sub-par products make their way to shelves because producers and retailers know that by labeling something organic, they will reach a buyer they might not otherwise, regardless of quality. You are seeing this now with some of the breweries that are showing up for the race to quench the organic beer market, but are not bring much to the line. For example, Peak Organic Brewing Company out of Maine is a mediocre at best brewery that probably wouldn’t have the reach it does if it wasn’t for ‘Organic’ in its name. People buy it (and many others) because of the organic stamp, not because it is a good beer that happens to be organic. The focus should be how can we make a dynamite beer using these organic ingredients, instead of lets go organic and try to make beer. Too often breweries seem to be too focused on going organic, and not focused enough on what makes a great micro-brew great…the taste. But that is not always the case. One example being Otter Creek Brewing Company out of Vermont that produces three 100% organic beers under the name Wolavers, which aren’t bad at all (I recommend the oatmeal stout). Yet even Otter Creek isn’t fully committing to the organic movement, but rather appear to be trying it out. To find the fully committed, you have to travel to a small town like Black Mountain, NC. As I mentioned in my previous post, KFB and I made the drive down to Black Mountain for my grandmother’s 90th birthday. It was a weekend full of celebration, with lots of family from all over the US. After the birthday event, we trekked on over to the Pisgah Brewing Company’s taproom, a simple warehouse, with a stage, a bar, a few stools and some picnic tables. If there was ever a simple bar that made you smile just by walking in, this is the place, with a dozen or so libations flowing from the wall taps as if they were the headwaters of the Appalachians. 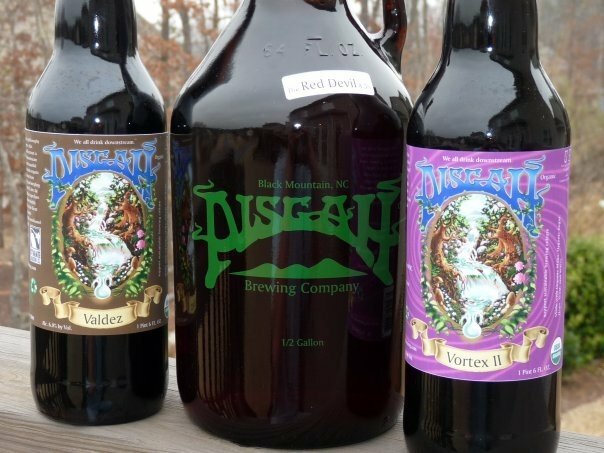 I was introduced to the Pisgah Brewing Company a few Christmas’s ago while down in NC with family. 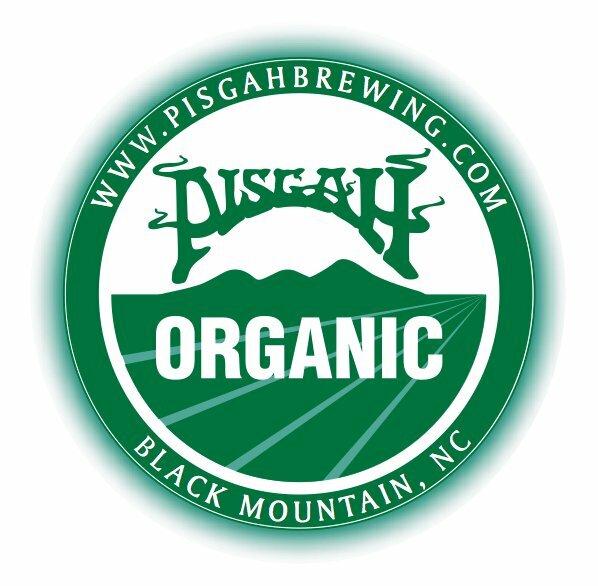 All Pisgah beers are certified organic, which plays out as more of an aid to creativity than a hindrance. They currently offer 6 year round beers (Endless Summer Ale, IPA, Porter, Nitro Stout, and Solstice – a Belgian at 9.5% abv) and 6 additional seasonals (Schwarzbier, Roasted Chocolate Stout, Bacon Stout, Apple Jaxx, vortex 1 – dubbed ‘hoppiest beer in Buncombe County’, Valdez – a coffee stout). You can feel the creative experimentation on each taste bud as the beer runs down the mouth. Thankfully, that experimentation really seemed to pay off. All of the beers I tried (all 6 of the year rounds) were delicious. It’s a place like Pisgah Brewing Company that reminds you of what micro-brewing is all about: Getting out of the box and making different flavors come together in a unique way. If you find yourself in western North Carolina with access to a Pisgah brew, you’d be silly not to grab it. So what do you think about organic beers? Do you have any that you would recommend or not recommend? Their stuff sounds great–I’d like to get my hands on the Soltice. Most organic beer just tastes way too thin for me. I’m wonder if b/c the ingredients are most likely significantly more expensive, they just use less of them, instead of trying to recreate a normal, robust flavor while charging more for the product. I’ve had two all organic beer’s recently: Bison Brewing Co. out of CA, and Uinta Brewing Co. out of Utah and they seem to have chosen the former approach. Their flavor dial was set to 4 when any good craft brewer usually tries to amp it up.